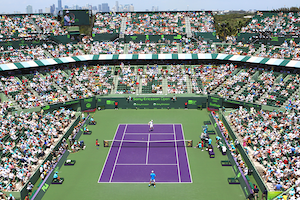 While other top players prematurely tumbled out of the tournament or skipped the Sony Open Tennis event altogether, Novak Djokovic and Andy Murray forged full steam ahead. Less than 24 hours after Djokovic hammered Lukas Rosol 6-1, 6-0, Murray took care of Bernard Tomic 6-3, 6-1 during second-round action on Saturday afternoon. The third-ranked Scot struck eight aces and held all eight of his service games to prevail in a mere 56 minutes. Tomic held his first two service games of the match and even saw multiple break points at 2-1 in the opener, but it was downhill for him the rest of the way. The 20-year-old Australian dropped five of the next six games, including at 3-5 on his own serve. Tomic, who explained afterward that he had been dealing with an illness, was more hopeless in the second. He won a mere two return points and saved none of the break points he faced. After one week of play, the cream of the ATP has risen to the top at the Australian Open. Although some had a tougher road than others, eight of the top seeds are still in the hunt. Here’s a look back at the tournament’s key moments to date. In the first round, Igor Andreev’s forehand gave world number one Roger Federer all sorts of headache. After stealing the first set, Andreev was just one forehand winner away from serving for a two set to one lead. When Andreev’s shot sailed long, so did his opportunity at an upset. Thereafter, Federer cruised through his matches. Another difficult challenge lays ahead for Federer in the fourth round in Aussie Lleyton Hewitt who will have the support of the crowd. Still, Federer is favored in that match. Should Federer advance, his tasks gets more complicated since he could face Nikolay Davydenko in the quarters, a man who has beaten him their last two meetings. While Fernando Verdasco, a semifinalist last year, struggled through his first round match then benefited from a retirement his last round; Davydenko, his fourth round opponent, has been in peak form through three rounds. If Davydenko moves on to the quarterfinals, Federer’s streak of 22 consecutive majors semifinal will be in serious jeopardy. An astounding fatality in the first round was French Open finalist, Robin Soderling. Playing Marcel Granollers ranked 113, Soderling let a two set to none advantage evaporate. Current U.S. Open champ Juan Martin Del Potro who has been dealing with a wrist injury also made an early exit. After defeating James Blake in a thrilling second round match, in the fourth round, Del Potro fought hard but came up short against Marin Cilic in another five setter. 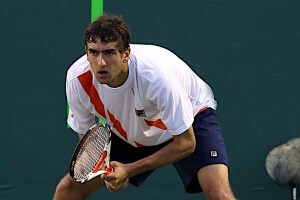 Cilic who has now gotten to the quarterfinals in the last two majors will battle Andy Roddick. Although Roddick has been pushed with each passing round, he’s had the answers. After straight sets wins in rounds one and two, Roddick required four sets against Feliciano Lopez, then five versus Fernando Gonzalez, the Australian Open 2007 finalist and his coach’s former pupil. If Roddick aces the Cilic exam, it will be either Rafael Nadal or Andy Murray his next nemesis. In the men’s doubles in Melbourne, the second seed, Mike and Bob Bryan, beat Mark Knowles and Mahesh Bhupathi, the third seed, 2-6, 7-5, 6-0 to win their third Australian Open title. Knowles and Bhupathi dominated the first set, breaking at love to take a double break lead. Throughout the second set, Mark and Mahesh had multiple break chances, but failed to seize any, as the Bryans held firm. As Knowles served to send the set into a tiebreak, he double faulted and missed an easy volley to give the Bryans double set point. When Bhupathi tracked down a spectacular lob from his opponent and dumped the next stroke into the net, the Bryans equalized the match. In the third set, the Bryans shifted to a higher gear. After holding serve, Mike and Bob had double break point and converted with a lob for a winner. On cruise control, the Bryans broke at love to secure the ultimate set and the championship. World number one, Daniel Nestor and Nenad Zimonjic were upset in the second round by Oliver Marach and Lukasz Kubot. That team then fell in the quarterfinals, ousted by Bhupathi and Knowles. A day earlier, Venus and Serena Williams took the women’s doubles title by defeating Ai Sugiyama and Daniela Hantuchova 6-3, 6-3. After trailing in the first set 3-0, the Williams’ won six consecutive games to seal the first set. The second set was very competitive with the teams trading breaks back and forth. Finally, in the eight game, the Williams’ captured the lead and never relinquished it. A holder of the other three major titles in doubles, Sugiyama was denied the completion of the career doubles slam. Sugiyama and Hantuchova, seeded ninth, knocked out the number one seed, Liezel Huber and Cara Black, in the quarterfinals. In a reversal of last year’s Wimbledon, the siblings took both titles. However, this time, it was Serena holding up the singles trophy. Moreover, Venus deserves a great deal of praise for sticking around and playing so well after losing in the second round in singles. The mixed doubles winner has yet to be decided as Sania Mirza and Bhupathi will play against Nathalie Dechy and Andy Ram.